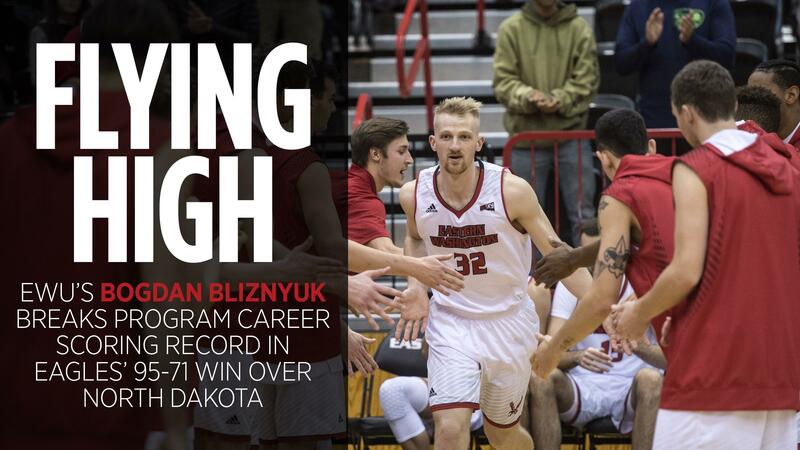 Bogdan Bliznyuk rose to his own occasion Thursday night, and so did Eastern Washington. It took barely a minute for Bliznyuk to hit a sweet 3-pointer from the corner that made him the leading scorer in school history. “It’s a moment I’ll remember for the rest of my life,” said Bliznyuk, whose family drove from the Puget Sound area to witness the moment. The Eagles channeled that energy the rest of the night, cruising past North Dakota 95-71 before an appreciative crowd of 1,679 at Reese Court. That was the whole idea, said Blizyuk, who was still scrapping for every point, every rebound even as the Eagles enjoyed a 20-point-plus lead late in the game. “I’m glad the team played really well, so that (the record) wasn’t a lone bright spot,” Bliznyuk said. “There’s a lot to be happy about tonight,” said Bliznyuk, who broke the record of 1,803 set two years ago by former teammate Venky Jois. Besides the record, the Eagles took a wire-to-wire win over UND to improve to 10-11 overall and 5-3 in the Big Sky Conference. As usual, Bliznyuk set the tone, hitting 12 of 15 field goals and scoring a game-high 28 points. He also showed his versatility with seven assists. “I think he’s the best player in the league, so he means a lot to us,” coach Shantay Legans said. “He comes out and works hard every day, is the last guy in the gym and always encourages his teammates. Bliznyuk gave all night against UND. With 11 minutes left and the Eagles up by 22, Bliznyuk took a nice pass from Richard Polanco, drove hard for the basket and was sent sprawling to the court by the Fighting Hawks’ Marlon Stewart. Bliznyuk hit the resulting free throw to complete a three-point play, and went on to play 36 minutes. “Coach is preaching to play 40 minutes, but we played a good 35 today,” Bliznyuk said. With Blizyuk trailing Jois by one career point, the historic moment promised to come early. And it did. One minute, 16 seconds into the game, as fans were still settling into their seats, Bliznyuk took a pass from Jack Perry, set his feet just outside the arc in the right corner and let fly: Nothing but net, and nothing but joy at Reese Court, as teammates rushed Bliznyuk at midcourt and fans rose to their feet. “I wasn’t trying to force anything, just trying to play the way I have been,” Bliznyuk said. The Eagles took it from there, hitting 12 of their first 15 shots in taking a 30-8 lead with 11:54 left in the first half. North Dakota (7-13, 2-6) got within 50-36 at halftime and closed to 52-44 less than 90 seconds into the second half. Guard Cody Benzel hit a trio of 3-pointers in 81 seconds to put the Eagles up 61-47, and the lead grew from there. Eastern took its biggest lead, 85-59, with 5:23 left on a jumper by Bliznyuk. Benzel finished with 15 points on 5-for-9 shooting, all from beyond the arc. Mason Peatling had a double-double with 11 points and 11 assists, and Sir Washington had 11 points and five boards. The Eagles host Northern Colorado on Saturday at 2:05 p.m. Published: Jan. 25, 2018, 8:30 p.m. Updated: Jan. 25, 2018, 11:22 p.m.